In zoology, skipper or skipper butterfly is the common name for any of the butterflies comprising the family Hesperiidae, characterized by antennae clubs hooked backward, stocky bodies, and typically quick, darting flight habits, which is the source of their name. They also differ from the true butterflies of the family Papilionoidea by generally having stronger wing muscles and better eyes. There are about 4,000 recognized species of skippers and they occur worldwide, but with the greatest diversity occurring in the tropical regions of Central and South America. Hesperiids, or skippers, provide an important function in the ecosystem as pollinators of flowering plants. Ecologically, they also are very important as part of food chains, consuming plant matter as caterpillars and largely nectar as adults, and being consumed—as eggs, caterpillars, pupae, or adults—by a large variety of animals. For example, as eggs they serve as food for mites, lady beetles, and green lacewings; ants and wasps consume caterpillars; mice and shrews eat pupae; and various birds, frogs, spiders, and mantids eat caterpillars. Skippers also provide important functions for humans beyond their ecological role. In particular, they provide aesthetic beauty in nature with their often colorful forms, adding a special pleasure to their sighting in the outdoors. The fact that they are non-biting is a plus as well. In addition, their sensitivity to toxins and pesticides makes them important indicator species for the health of ecosystems. Skippers are considered a type of butterfly. The Order Lepidoptera commonly is separated into two groups, the butterflies and the moths. A lepidopteran generally is considered a butterfly if it belongs either to the superfamily Papilionoidea ("the true butterflies") or the superfamily Hesperioidea (“the skippers”), the latter of which has only one family, Hesperiidae. Some authors also would include as butterflies the members of the superfamily Hedyloidea ("the American butterfly moths"). Although the skippers are usually counted as butterflies, they are somewhat intermediate between the rest of the true butterflies and the remaining Lepidoptera, the moths. Skippers differ in several important ways from the true butterflies. However, Hesperioidea and Papilionoidea are considered sister taxa, so the butterflies collectively are thought to constitute a natural group or true clade. Indeed, some modern taxonomists place them all in superfamily Papilionoidea, distinguishing the skippers from the other butterflies at the series level only. In this system, Papilionoidea consists of the series Hesperiiformes (with one family only, the skipper family Hesperiidae) and the series Papilioniformes (with five families). 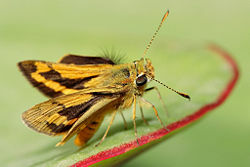 When skippers are classified in the superfamily Hesperioidea, it also includes the one family, the Hesperiidae. Hesperioidea, Papilionoidea, and Hedyloidea also are viewed by some taxonomists as constituting a clade. Skippers differ in several important ways from the true butterflies of the superfamily Papilionoidea and members of the neotropical superfamily Hedyloidea. Collectively, these three groups of butterflies share several characteristics especially in the egg, larval, and pupal stage (Ackery et al. 1999). However, skippers have the antennae clubs hooked backward like a crochet hook, while butterflies have club-like tips to their antennae, and hedylids have feathered or pectinate antennae giving them an even more moth-like appearance than skippers. Skippers also have generally stockier bodies than the other two groups, with stronger wing muscles, and have more well-developed eyes. Caterpillars have a constriction in the back and typically a large head. Spreadwing skippers in the subfamily Pyrginae tend to hold both pairs of their wings flat, in a single plane, while others hold the fore-wings at an angle, but the hind-wings flat. Hesperiid geographical distributions, larval foodplants, immature stages, and phylogenetic relationships remains poorly understood (Warren et al. 2008). There are about 4,000 known species of skippers (Bridges 1993) distributed among 567 genera (Warren et al. 2008). Many species of skippers look frustratingly alike. For example, some species in the genera Erynnis, Hesperia, and Amblyscirtes cannot currently be distinguished in the field by experts, the only reliable method of telling them apart involving dissection and examination of the genitalia. Taxonomy of the subfamilies remains unsettled. For example, some authors recognize the "giant skippers" as the subfamily Megathyminae (Mielke 2004, 2005), while others recognize them as a family (Freeman 1969), or a group of genera within the subfamily Hesperiinae (Ackery et al. 1999; Warren et al. 2008). Some authors have recognized an eighth subfamily, Euschemoninae, which includes only the large, brightly-colored Australian skipper, Euschemon rafflesia, which is unique among hesperiids, and indeed butterflies, in having a frenulum and retinaculum in the male, which joins the fore- and hindwing together (Warren et al. 2008; Brower and Warren 2007). (A similar feature is found in various taxa of moths (Brower and Warren 2007)). Some authors treat Heteropterinae or Megathyminae as subordinate taxonomic groups within the subfamily Hesperiinae (Warren and Bridges et al. 2008). Brower and Warren (2008) recognized the seven subfamilies of Coeliadinae, Hesperiinae, Eudaminae, Euschemoninae, Heteropterinae, Pyriginae, and Trapezitinae. A phylogeny of some subfamlies families based on DNA sequence data. Warren et al. (2008), using DNA sequence data from three gene regions, found strong support for the monophyly of the family Hesperiidae. They also found support for the monophyly of several of the traditionally recognized subfamilies. The monophyly of Coeliadinae, Pyrrhopyginae, Heteropterinae, Trapezitinae, and Megathyminae is strongly supported by their research, while the monophyly of Hesperiinae is moderately supported. Pyrginae if found to be paraphyletic. However, Warren et al. placed Pyrrhopyginae and Euschemon deep within the Pyrginae and placed the giant skippers (Megathyminae) deep within Hesperiinae. "Pyrginae," being of paraphyletic grade composed of several clades, requires additional word to make a satisfactory classification. ↑ A. Warren, J. Ogawa and A. Brower, "Phylogenetic relationships of subfamilies and circumscription of tribes in the family Hesperiidae (Lepidoptera: Hesperioidea)," Cladistics 24(2008)(issue 5):642-676. Ackery, P.R., R. de Jong and R.I. Vane-Wright. 1999. The butterflies: Hedyloidea, Hesperioidea and Papilionoidae. Pages 263-300 in N.P. Kristensen, ed., Lepidoptera, Moths and Butterflies. Volume 1: Evolution, Systematics, and Biogeography. Handbuch der Zoologie. Eine Naturgeschichte der Stämme des Tierreiches / Handbook of Zoology. A Natural History of the phyla of the Animal Kingdom. Band / Volume IV Arthropoda: Insecta Teilband / Part 35. Walter de Gruyter, Berlin, New York. ISBN 3110157047. Atkins, A.F. 2005. Skipper butterflies: Their origins? a preliminary discussion on the higher systematics and a proposed phylogeny of the Hesperiidae. news Bull. Entomol. Soc. Queensland 33: 24-34. Bridges, C.A. 1993. Catalogue of the family-group, genus-group, and species-group names of the Hesperiidae (Lepidoptera) of the world. Published by Author, Urbana. IL. Cited in Warren et al. (2008). Brower, A. V. Z., and A. Warren. 2008. Hesperiidae Latreille 1809. Skippers Tree of Life Web Project version April 7, 2008. Retrieved January 28, 2009. ———. 2007. Euschemoninae Waterhouse & Lyell 1914. Euschemon rafflesia W. S. Macleay 1826. Euschemon Doubleday 1846 Tree of Life Web Project, version February 21, 2007. Retrieved January 28, 2009. Freeman, H.A. 1969. Systematic review of the Megathymidae. J. Lepidopterists Soc. 23(Suppl. 1): 1-59. Mielke, O. H. H. 2004. Hesperiidae. Pages 25-86 in G. Lamas, ed., Checklist: Part 4A. Hesperioidea, Papilionoidea. In C.J. Callaghan, G. Lamas, and J.B. Heppner, Atlas of Neotropical Lepidoptera, volume 5A. Gainesville, FL: Scientific Publishers [for the] Association for Tropical Lepidoptera. ISBN 0945417284. ———. 2005. Catalogue of the American Hesperioidea: Hesperiidae (Lepidoptera). Curitiba, Parana, Brazil: Sociedade Brasileira de Zoologia. 6 volumes. Warren, A., J. Ogawa, and A. Brower. 2008. Phylogenetic relationships of subfamilies and circumscription of tribes in the family Hesperiidae (Lepidoptera: Hesperioidea) Cladistics 24(5):642-676. Retrieved January 28, 2009. This page was last modified on 23 September 2015, at 15:09.